HELP FOR THE PARENT COACH! 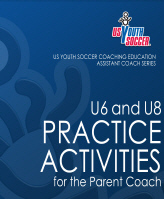 US Youth Soccer is keeping a wonderful resource alive for use by youth soccer coaches. They have made available electronic versions of their timeless Practice Activities for the Parent Coach and we at Hamilton Girls Soccer are happily making them available to YOU - our volunteer Parent Coaches! Written in by Tom Fleck and John Cossaboon and published in 1988, it is now available electronically in PDF form for free! 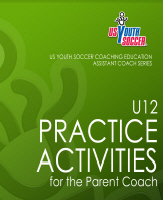 These are a great resource for ideas to do at your practices/training sessions with your players! Print them out or view online or download a copy to your mobile device!...It's all there! These make coaching easy! The goal of the US Youth Soccer Board of Directors is to make coaching materials available for free or at a very reasonable cost to the youth soccer coach. They want thousands upon thousands of American coaches using the materials. See www.usyouthsoccer.org for more details! Select and click the appropriate document for the age group/Division you are coaching! Thinking about stepping up and coaching your daughter, niece, or younger sister's team but not sure of what to do at practices/training sessions?! Here we have provided some resources for you! Remember to keep your practices FUN! First and foremost please check out the Hamilton Girls Soccer Club Coaches Handbook! And here's some pointers on How To Write a Training Session for your team or group! WHY does Hamilton Girls Soccer play soccer in a Small Sided Game format?! Here's the reasons why...as published by US Youth Soccer! We have a zero-tolerance policy for unsportsmanlike conduct. Any breach of this policy can result in suspension or removal from club activities. 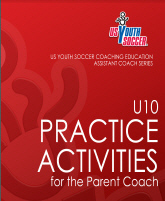 The US Soccer Federation in 2011 released the official US Soccer Coaching Curriculum. Part of this document included the explanation of basic soccer tactics! Both attacking and defending tactics are explained and shown. Below is the link oh reader, to a wealth of knowledge to help you and especially your players understand the game of soccer and how it really is a team game! Do not hesitate to print out a page or two of this and show while explaining to your players! The author of this document was none other that NJ born National player Claudio Reyna! Coaches (& players!!). US Youth Soccer has made available clips of specific soccer techniques for you to view, learn, and teach to your players! These skill topics and examples range from the Push Pass, Wedge Trap, Instep Drive, Receiving Ground Balls to Crossing the ball, Chipping, and Goalkeeper Punting! Something for ALL age levels! So grab a ball, turn up the volume on your computer or hand-held device and get ready to learn! Then pass these skills on to your players or direct them to this page! !